Skopje is the capital of the country and expectedly the economic, administrative, cultural, political center. Skopje is just 20 minutes away from international airport "Alexander the Great" which connects flights from many European countries and several worldwide destinations and is quickly developing as the low cost airport in the Balkans. Taking that in consideration it is not hard to guess Skopje is the most visited city by foreigners in Macedonia. Skopje is a relatively small capital city with official population of just over half a million people, however it gets lots of daily commuters from all over the country and is the educational center hosting more than 70,000 students, therefore the numbers can easily go over 700,000. 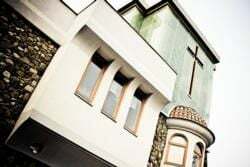 Although the territory around Skopje has been populated for over 6000 years there are very few remains due to past seismic activity most notably in 1963 when a devastating earthquake ripped through the city. 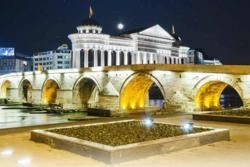 Skopje has had an important role throughout history and has been a significant center for trade and merchants and an important strategic position for military leaders. The name itself is derived from the Macedonian phrase "with spear - so kopje" which as time went by got transformed in to Skopje. Nowadays Skopje continues its legacy as it paves the way for an EU future for Macedonia and is viewed as a role model for the rest of the country. The city can go hand in hand with European metropolitan cities as a multinational, multicultural and a city with many religions making it a cultural hotspot. As every capital city the landmarks play a major role in the creation of the city's character and provide the best attractions for incoming tourists. The city has undergone a major reconstruction project that aimed to portray the true heritage and history of Macedonia and is due to be completed in 2014. The most important part of course is the city center. 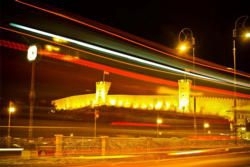 Here lies one of the most recognizable symbols of Skopje, the Stone Bridge. Built in the Ottoman rule between 1451 and 1469 and represents the link between the city's past and future. It connects the old part of town that has the Old Bazaar and Kale Fortress with the Macedonia Square and Macedonia Street. The Old Bazaar is the beating heart of Skopje, attracting as many tourists as it does merchants and traders. It portrays the multicultural mix of the city at its best as it has numerous traditional restaurants and is the host of one of the most important religious landmarks in the city, Mustapha Pasha Mosque and the Church of the Holy Saviour. The Macedonia Square which is the main square of the city is the home of many monuments dedicated to historically important figures, most notable of which is the statue called "Warrior on a Horse" dedicated to Alexander the Great. 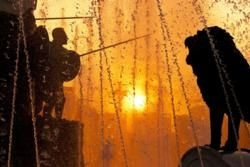 The statue itself is built into a large fountain and stands at a colossal 22 meters high. The square is also home to many shops, restaurants, bars and coffee shops and several shopping malls making it a must visit destination. Skopje is the cultural capital as well. The city is the host of many events and is the home of Macedonian Opera and Ballet, Macedonian Theatre and numerous museums such as the Archaeological Museum, the Museum of Macedonian Struggle and the Holocaust Memorial Centre of the Jews in Macedonia. There are also many smaller museums dedicated to a specific cause or person of which the most important one is the memorial house of the most famous Macedonian of the 20th century, Mother Theresa who was born in Skopje and is of a catholic Albanian decent. The city is also full of cultural events throughout the year. One can visit the Opera House throughout the year, but it takes the main stage in May with the traditional May Opera Evenings. There are many more to choose from such as the likes of BeerLand, OffFest, Wine Festival, White Nights, Cinedays, Skopje Jazz Festival, so make sure you check our calendar to see what's on during your stay in the city. Skopje airport "Alexander the Great" is quickly becoming one of the main airports in the region offering many flights to and from European countries and several long distance destinations. It is located 20 km from the city centre and there are regular shuttle services to and from the airport. 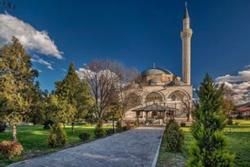 Check out our top ten attractions in Skopje.